Nothing says stress like the holidays. Whether it’s reunions with relatives who ask all the wrong (read: intrusive) questions, or buying the perfect gift so it won’t be returned the next day, or the pressure of creating the best holiday meal the family has ever had — the point is, when it comes to parties, they should actually be enjoyable. 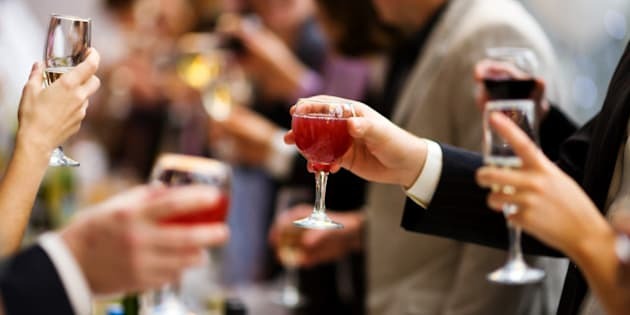 Since we know rushing to get everything done at the last minute can feel impossible, we spoke to the experts at the LCBO to steal their tips on what works in terms of eating and drinking, for everyone from the veteran party-thrower to the first-timer. What can we say? We think the person throwing the party should be able to enjoy it just as much as the people who were invited. 1) Choose your own “house” wines — red and white. This way you don’t have to worry about changing or washing glasses as different bottles are opened. It’s also easy to have versatile wines that match well with everything you’re serving. 2) Serve one or two simple drinks. No one needs to be a certified bartender to make popular cocktails like vodka and cranberry or rye and ginger. These take just moments to put together, leaving you more time with your guests. 3) Partner beer with cheese. Serving cheese is all the rage but it’s also a classic crowd pleaser. Beer’s complex flavours complement cheese very well. The carbonation cleanses the palate and the hops helps balance the richness of the cheese. Lighter beers can be matched with mild, creamy cheeses, while full-flavoured brews can handle stronger varieties. A simple cheese fondue is a fun activity for everyone and is the perfect partner with beer. Ask your local LCBO or liquor store’s product consultant for help in pairing your selections. 4) Pour perfectly pre-mixed drinks. Sit back and relax while your guests are there and have ready-made cocktails for your guests. Whether you opt for a punch or individual drinks bought from the store — there are lots of options. 5) Try a mini beer keg. For a cottage Christmas or a casual gathering a mini keg is both novel and convenient. Check out your local LCBO, liquor or beer store for a selection of mini kegs. 6) Offer a memorable cocktail, which don't necessarily need to be so fancy or difficult to make. Pick one that’s easy and fun, and try out some new flavoured spirits to make your cocktails more festive. 7) Finish with a fireside sipper. When your holiday feast is starting to wind down, it’s nice to offer an after-dinner drink that mellows out the crowd. Consider serving a specialty coffee with a splash of liqueur.